In this course, Prof. Clark Tu-cuong Nguyen covers topics ranging from: Integrated circuit device fabrication and surface micromachining technology. Thermal oxidation, ion implantation, impurity diffusion, film deposition, expitaxy, lithography, etching, contacts and interconnections, and process integration issues. Device design and mask layout, relation between physical structure and electrical/mechanical performance. MOS transistors and poly-Si surface microstructures will be fabricated in the laboratory and evaluated. 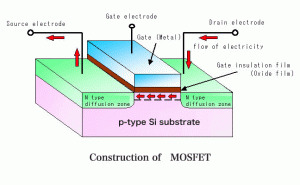 The construction of a metal–oxide–semiconductor field-effect transistor (MOSFET).